Yesterday February, 19, it took place the opening ceremony of the work of Finnish artist Kaarina Kaikkonen in Madrid, ‘Tocando el cielo / Touching the sky' , with the presence of Minister of Culture and Sport of Finland, Paavo Arhinmäki, Ambassador of Finland in Spain, Roberto Tanzi - Albi, director of the Instituto Iberoamericano de Finlandia, Auli Leskinen, and a representation of Humana. During his speech, Arhinmäki referred to the connection between used textile, recycling, environmental protection and development cooperation. 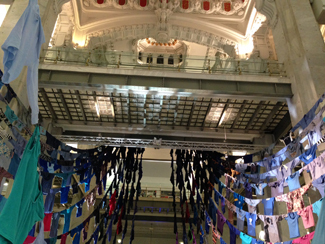 This Kaikkonen’s work is a spectacular installation in the courtyard of Operations CentroCentro Cibeles Cultura y Ciudadanía, built from hundreds of clothes, from the Humana sorting center in Leganés. Team classification has chosen these clothes, following the guidelines of the Finnish artist. This large facility, part of ARCO Focus Finland program is deployed from the fourth floor to the main courtyard of CentroCentro. As described from the American Institute of Finland "height main lobby of CentroCentro and the way in which visitors enter the installation, slowly , not knowing what to expect, it has been the source of inspiration when create this original proposal. 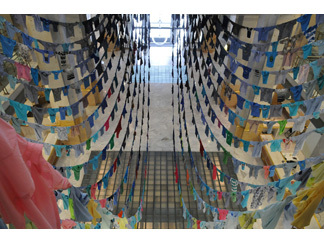 Installation as a layer invites visitors to take refuge under your protection and to feel the presence of the crowd, they can even touch the clothes donated by the citizens themselves. However, the work also directs the eyes to the sky, so it will look in two directions, and the everyday and the celestial are intertwined. " The American Institute of Finland, in collaboration with the own CentroCentro Cibeles, Frame, and Galerie Forsblom Foundation promotes this facility, open to the public until September 14. 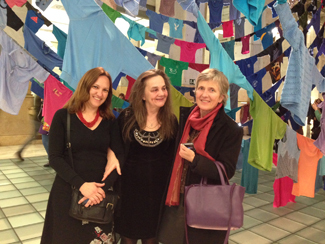 The virtuous circle of used textile has an intermediate stop: culture. Humana supports all kinds of arts and culture through the loan textile companies theater, film and television producers, cultural venues and artists of various kinds manifestations. It’s recycled culture.